Unless you're still in a stuffing coma, or on cranberry sauce detox or been living under a rock for the last month, you probably know that REI is closed today. The international audience may ask, why is this a big deal? Well, in the US it is Black Friday. Since 1932, the day after Thanksgiving has been regarded as the beginning of the Christmas shopping season. People line up outside stores Thanksgiving night to get into stores for massive promotions and savings. Every local news station in America tonight will have video of some scuffle inside some local retail store today, with people going full Fight Club on each other to save 50% on the last Crock Pot. Check YouTube tonight - you'll see it. In 2015, online revenue ALONE was $1.6 billion dollars on this single day. Retail "walk-in" sales were over $12 billion dollars. And for the second straight year, REI is opting out. All 149 stores are closed. The e-commerce site is closed as well - you can put stuff in your e-basket, but no orders will be processed today. Over 12,000 employees have a paid day off. And REI has worked with Federal, State and Local municipalities to reduce park, conservatory and nature trail access fees across the country. 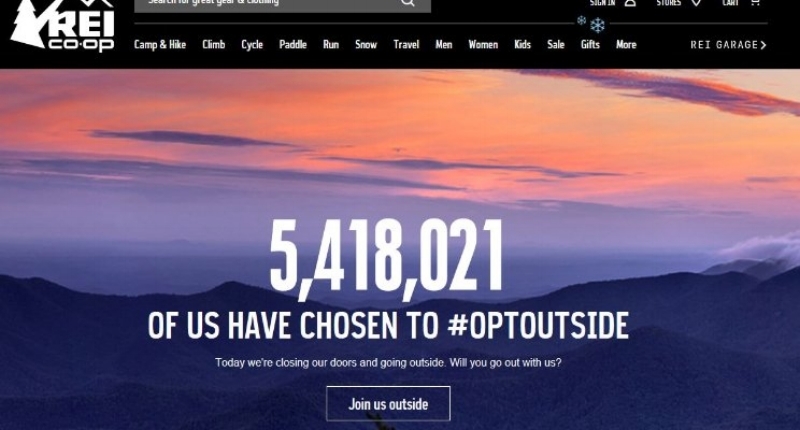 REI has created the #OPTOUTSIDE hashtag and at the time of this post, almost 5.5 million people have taken the pledge on the REI website to "go play outside" rather than spend time in a store, shopping. And this year, REI reports over 275 organizations, agencies and companies are joining them. And I think it's the most brilliant example of social selling ever. Now let's have full disclosure. I am card carrying member of REI. I do shop there. And as a sales professional in the Pacific Northwest, I've been lucky enough to work with REI as a partner. Also a few years back when I was at Xerox, REI hosted an event in their Seattle HQ where I spoke, along with leaders from companies like T-Mobile and Waste Management and International Paper, about corporate sustainability initiatives. But as a member I am representative of their market. I am a business professional with disposable income, who runs, bikes, hikes and spends a great deal of time outside in the open air. I am technically adept, using twitter and Facebook and other social media avenues daily/hourly. And I am not a Black Friday shopper. There are over 6 million REI members at last count. And - drumroll - members account for over 80% of REI sales. Did you get that? Hold that percentage in your head. Now since I have had B2B dealings with REI, I am 100% convinced that this campaign is in-line with their core values as an organization. This is no simple marketing campaign. REI decided a few years back that everything was about "experience." (yes, Derek is talking about "experience" again - deal with it) When other orgs were debating "omni-channel" marketing, they went "digital first." Because they believed since people organize their lives around mobile, mobile should be the first channel you communicate to them on. REI has decided that it doesn't want to be the best place to sell you a six person tent. It wants to be the place that gives you the best camping experience with your kids. In his article, Cassidy argues that REI has built its brand on "the outdoor experience" not just simply being the "place" to buy your "stuff" for your outdoor excursions. Take a look at twitter today - who do you think REI is communicating to? And what are they saying? IMHO, REI is communicating to the people who account for 80% of their sales - people like me - that they are not simply giving lip-service to their core values. They're bucking conventional wisdom and putting up a "Gone Fishin" sign and giving 12000 people the day off. To go outside and play. To "experience" the outdoors. To live what REI preaches. They are also communicating to the millions of people that AREN'T members what "membership" at REI really means. Social selling is the "process of developing relationships as part of the sales process." We go back and forth here on LinkedIn here about how best to do it, if it even works, how often we should to it, whether we should to it instead of cold calling or offering discounts or whatever. I would argue what we're witnessing is the greatest example of social selling to date. Core value commutation to a target market via social means that builds and strengthens a personal relationship to the REI brand. And I would argue B2B sales orgs need to take note - I haven't talked to a single REI salesperson today - not one cold email, not one cold call, not one attempt to prospect me over LinkedIn. I have no idea what's on Sale and what's not at REI. Yet I know exactly what REI is saying. So does every other "business professional with disposable income, who runs, bikes, hikes outside in the open air." You know, the kind of person that is a target B2B prospect, influencer or decision maker. Yes, I would argue all of that...but it's 10am and I'm going to take my dog out for a hike. I'll start my Christmas shopping on tomorrow. Guess where?